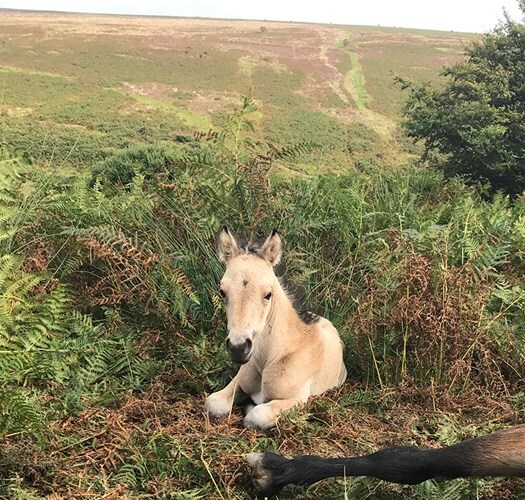 We discovered little Lady Luna - a specially-bred Exmoor X Cremello moorland foal - while we were taking part in an Exmoor Pony walk out on the Exmoor Forest and Hoaroak Valley. Lady Luna was lying tucked in the bracken beside her mother, a free-living pedigree Exmoor pony, who had sadly died that morning. We think she had got hung up in fencing and ruptured something after struggling to free herself. Between only 2 weeks and 4 weeks old, Lady Luna (named because she was discovered during the full moon) was still trying to suckle. Although she was wild-born and wary, I sat with Lady Luna for a while and managed to make a connection with her. 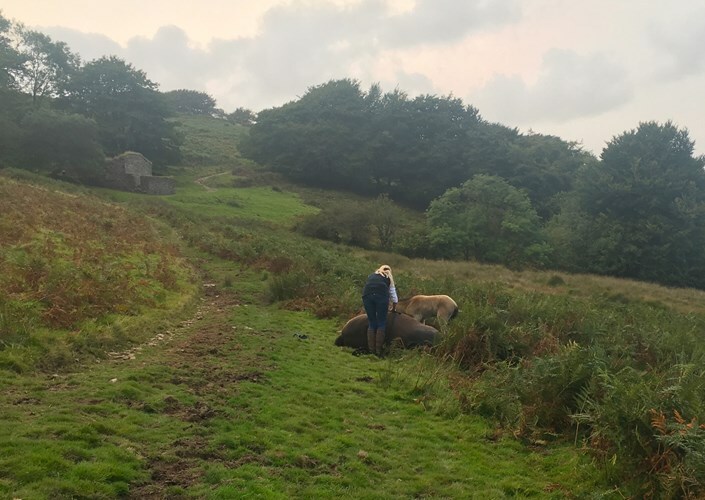 We introduced her to our Exmoor ponies Monty and Monsieur Chapeau (himself a previously rescued wild-born foal whose story is told in Wild Pony Whispering) and by the time we left her, I could tentatively start to stroke her on the shoulder and neck. The moorland valley where we found her is surrounded by thousands of acres of wilderness and has no road access. 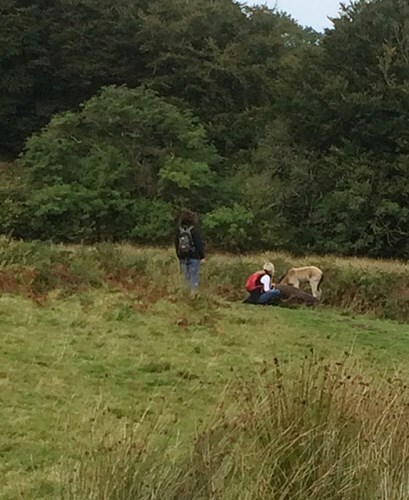 Our walk leader Rob walked to where he could get a signal and telephoned the farmer who owns the herd, to alert him. 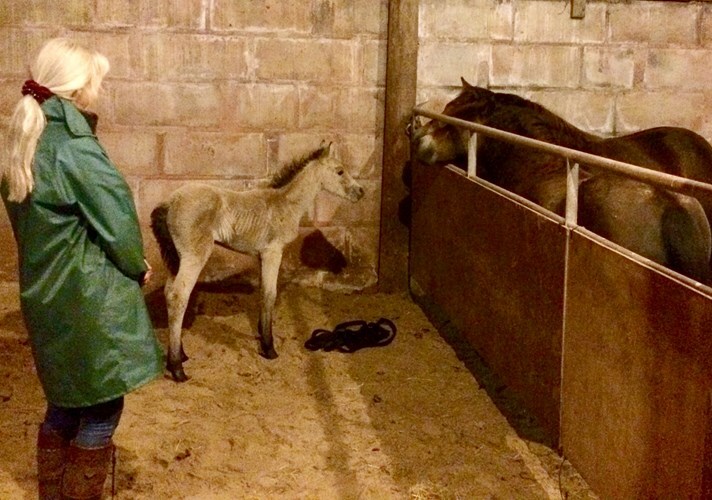 Moorland farmers will not generally try to hand raise a wild-born foal this young and the Exmoor Pony Project that I run with my husband Nick is at full capacity - so the future looked bleak for little Lady Luna. But she was brave and even in this distressing situation, was showing a willingness to connect with us. After discussion between all of us, the decision was made to try and help her. So Nick and I took our own ponies home and returned to the moor with the trailer and quad bike, and our friend Kate who had also been on the walk, to meet up with the herd owners (the Floyd family) - Nigel, Marie, Tom and Taylor - and see if Lady Luna would allow us to catch her. The only vehicle capable of carrying her out of the valley was a Gator and fortunately, the terrain was just about accessible for Nigel to get it close enough. Lady Luna was still standing with her dead mother and by now looking hungry and sad. Everyone stayed back while I spent some minutes getting close and re-establishing the connection we’d made earlier. 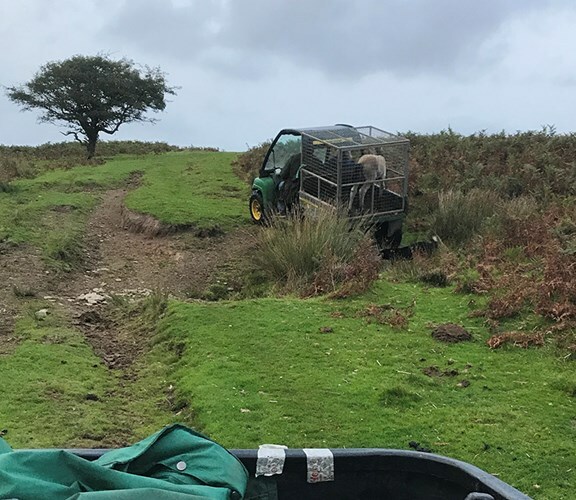 This allowed Nick and Tom to approach gently and soon, we had hold of Luna and were able to put her safely in the Gator. We all made our way back out of the valley, across Cheriton Ridge, and to the lane where Lady Luna was transferred to our trailer. She stood quietly inside with Nick as he reassured her. Everyone was smiling. We brought her back to our farm and into an enclosure in one of the barns. I called Monsieur Chapeau and Monty, who came in to sniff noses with Lady Luna over the gate. They stayed close by all night and are currently acting as ‘Uncles’. They had met Lady Luna out on the moor so can understand what’s happened to her. Nick had arranged for our local vet to supply some Mare Replacement Milk. Short of food, Lady Luna had unfortunately been chewing away at things like bracken, which are not good for ponies, and had become thin and tucked up. At about 3am, she finally accepted a little milk from a bottle and since then, we have been giving her regular feeds. It is not easy getting her to suckle but we are optimistic that she is gradually improving. She has a lovely temperament and has spirit and intelligence, which gives her a good chance of surviving and thriving. We already have a large number of Exmoor ponies in the Exmoor Pony Project (over 30) but we felt it important to offer Lady Luna this chance. Bags of Mare Replacement Milk cost around £120 a time and as well as a number of these over the coming weeks, Luna will also need Foal Creep pellets. 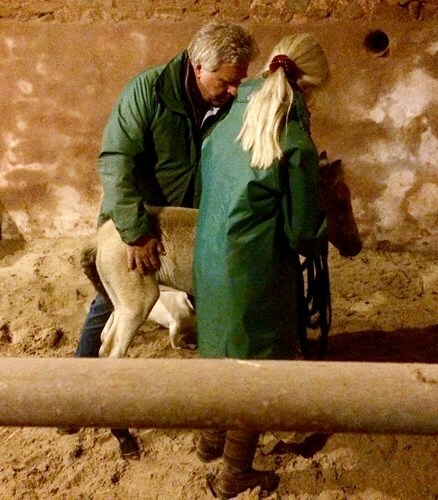 The costs of her initial rehabilitation, ongoing care, management and development - including feed, bedding, vet, registration, wormers, equipment, etc, will easily run into a few thousand pounds. So we are Crowd Funding to see if we can get some help with this. 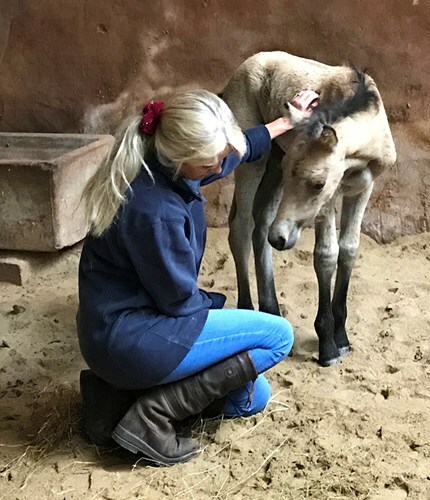 The Exmoor Pony Project run by Nick and Dawn Westcott, is unfunded, pays no salaries, and is assisted by a tiny number of volunteers. It is not set up as a 'charity' because we prefer to think of our work as offering opportunities to Exmoor ponies and promoting awareness of the breed, rather than ‘rescuing’ ponies. Although rescue is certainly part of our work. Lady Luna has arrived with us through absolutely no fault of her own and it is projects like ours that can give ponies like her a chance. We would very much appreciate your help to give her a good start. Thank you for your support. If you'd like to help Lady Luna please click here to visit her fundraiser.